Do you remember the Lemony Snicket books that took the children’s literature world by storm in the early 2000s? They were called A Series of Unfortunate Events. My own version of that title comes to mind every time I think of how Katie Wetherbee and I eventually came to write Every Child Welcome. Because the book truly is the result of a series of very fortunate events. Though I believe they were God-ordained events, not merely fortunate ones. The series of events began with at a special needs ministry inclusion conference in Des Moines, Iowa. Key Ministry sent a team, which included Katie, to conduct workshops at the conference. My first book had recently been published, and the conference coordinators invited me to host a book table and attend some of the workshops. Can you guess which ones I signed up to attend? If you guessed the Key Ministry workshops, give yourself a pat on the back! But before the first workshop started, a petite dark-haired woman with a smile as big as Iowa stopped by to introduce herself. “I’m Katie Wetherbee,” she said. “And I love your book.” We chatted for a few moments and an almost instant friendship formed. We both had kids who had overcome medical special needs. We both were former public school teachers with special education backgrounds. We were both interested in special needs ministry. We both blogged about special needs. And when I attended her workshops, I discovered that our teaching philosophies and styles were much the same. In fact, if we had ever had the opportunity to team teach in the public schools, we would have been a dangerous combination. “Then let’s write it together,” I suggested. So we did. We wrote a book with untrained children’s ministry volunteers, not children’s ministry leaders, in mind. We wrote it for Sunday school teachers and mid-week program volunteers who work in churches too small to offer a full-blown special needs ministry. We wrote it to equip children’s ministry volunteers who want to welcome every child into classrooms and clubs and programs, but aren’t equipped to do so. We wrote it to fulfill Jesus command in the gospel of Matthew. “Let the little children come to me and do not hinder them, for to such belongs the kingdom of heaven.” We wrote Every Child Welcome because this command is not limited to children who will sit quietly at His feet and listen, who color between the lines, who raise their hands and wait to be called upon, and who work at grade level. We wrote the book because we want every child to learn about Jesus. We wrote Every Child Welcome because in the fall of 2009, Key Ministry sent a team that included Katie Wetherbee to conduct workshops at a special needs inclusion ministry conference in Des Moines, Iowa. Thank you, Key Ministry, for being the first in a very fortunate, God-ordained series of events, which Katie and I believe the Father is using to introduce many children to His Son. 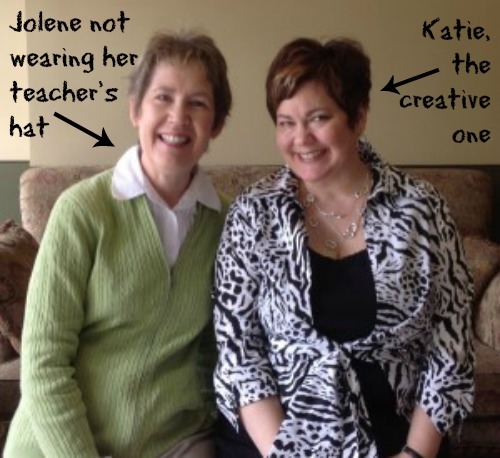 To keep up with Katie, check out her blog, Diving for Pearls. To keep track of Jolene, visit her blog at Different Dream. This entry was posted in Hidden Disabilities, Inclusion, Key Ministry, Resources and tagged children's ministry, church, Disability Ministry, Every Child Welcome, Family Ministry, Inclusion, Jolene Philo, Katie Wetherbee, Special Needs Ministry, student ministry, Sunday School teachers, volunteers. Bookmark the permalink. Thank you again, Key Ministry for being a crucial factor in bringing our book to life! Jolene…it’s a fabulous book. Glad to help get the word out around a resource that will help MANY churches more effectively serve kids with disabilities and their families. Jolene…the book is fabulous! So glad to hear it’s still near the top of Amazon’s children’s ministry best seller list. I have no doubt that untold numbers of kids and families will have the opportunity to come to know and grow in faith in Jesus as a result of Every Child Welcome!